Equation Arts > doodle art > Help I need a doodle! 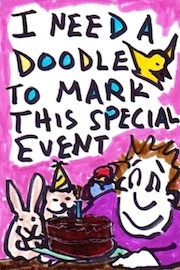 Sometimes the only thing that will do is a doodle made just for you. Maybe it’s your birthday or you got raise. 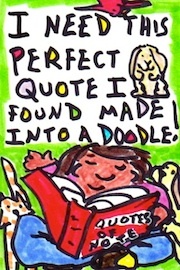 Or you’ve got a favorite quote that you want to immortalize in doodle form. 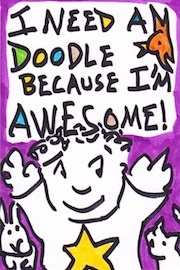 Maybe you’re feeling blue and you know a custom-made doodle is just the thing to get you feeling yourself again. Whatever your reason, I, Professor Doodleslice Cohen, am ready, markers at hand, to summon my inky magic to solve your doodle emergency. 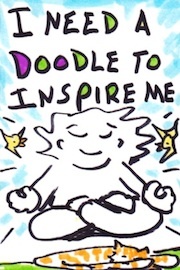 Just click on one of the big buttons below to pick the type of doodle you need. 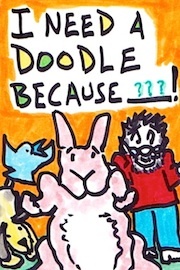 Then I’ll ask you a few questions so I can make a special doodle just for you. When your doodle is done (usually within 24 hours) I’ll scan it and email you a copy to tide you over during your doodle crisis, meanwhile I’ll bundle up the original for it’s journey to your door via the old-fashioned kind of mail. Each doodle dispatch is drawn and colored using markers on 5×7 inch watercolor paper. The price is $65 and that includes postage to U.S. and Canada (add $10 more for shipping to other countries). If you need a bigger doodle for a bigger doodle emergency I can do an 8×10 inch doodle for $120. What type of doodle do you need? 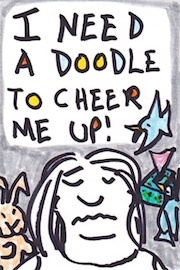 Because doodle emergencies are real.